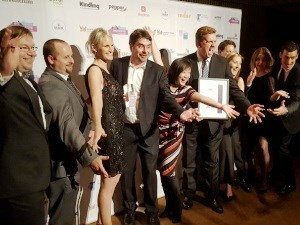 Mirvac Ranked Number 3 in Australia’s Most Innovative Companies! Mirvac Group (Mirvac) has been ranked number three in BRW’s 50 Most Innovative Companies list for 2015 and awarded the Best Innovation Program. Mirvac’s third place ranking was attributed to its innovation program, Hatch, and two current innovations that were submitted as part of the award: Mirvac’s use of CSR Velocity Panels which is revolutionising building in Australia and an internal workplace health and safety campaign. Mirvac’s CEO & Managing Director, Susan Lloyd-Hurwitz commented that the BRW listing was an outstanding achievement and recognised the importance of innovation currently taking place in Mirvac. “Being ranked number three in Australia is recognition of the work of passionate people in the business who are driving change at the front line. It’s also acknowledgement of a productive first year in which we defined our innovation strategy and launched our innovation program. “We are delighted that BRW has recognised the great work taking place across our business,” said Ms Lloyd-Hurwitz.